Porta thesium in ecclesia castrensi Wittenbergae. Disputatio pro declaratione virtutis indulgentiarum sunt 95 theses, quibus Martinus Lutherus malae indulgentiarum consuetudini nec non venditioni earum se opposuit. Die 31 Octobris anni 1517 eas litteris ad archiepiscopum Moguntiacum Magdeburgensemque Albertum Brandenburgensem directis adiunxit. Quod Albertus non respondit, Lutherus theses quibusdam familiaribus tradidit, qui eas Luthero nesciente in publico proposuerunt, quo modo disputatio toto in imperio coepta est. 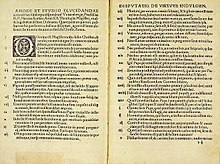 Num Lutherus re vera theses die 31 Octobris 1517 manu propria ad ostium ecclesiae castrensis Wittenbergae affixerit, ut traditio Lutherana vult, valde disputatur. 1: Dominus et magister noster Iesus Christus dicendo paenitentiam agite etc. omnem vitam fidelium paenitentiam esse voluit. 2: Quod verbum paenitentiae de paenitentia sacramentali, confessionis et satisfactionis quae sacerdotum ministerio celebratur, non potest intellegi. 3: Non tamen solam intendit interiorem, immo interior nulla est, nisi foris operetur varias carnis mortificationes. 4: Manet itaque poena donec manet odium sui, igitur paenitentia vera intus, scilicet usque ad introitum regni caelorum. 5: Papa non vult nec potest ullas poenas remittere; praeter eas, quas arbitrio vel suo vel canonum imposuit. 6: Papa non potest remittere ullam culpam, nisi declarando et approbando remissam a deo. Aut certe remittendo casūs reservatos sibi, quibus contemptis culpa prorsus remaneret. 8: Canones paenitentiales solum viventibus sunt impositi; nihilque motituris secundum eosdem debet imponi. 9: Inde bene nobis facit Spiritus Sanctus in Papa excipiendo in suis decretis semper articulum mortis et necessitatis. Kurt Aland: Die Reformatoren: Luther, Melanchthon, Zwingli, Calvin; mit einem Nachwort zur Reformationsgeschichte. Gütersloher Verlagshaus, Gütersloh 1986 (4. ed. ), ISBN 3-579-05204-7. Fritz Bellmann, Marie Luise Harksen, Roland Werner (ed. 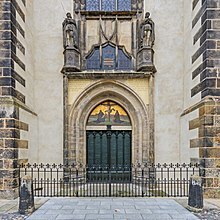 ): Die Denkmale der Lutherstadt Wittenberg. Hermann Böhlau Verlag, Vimarae 1979. Heinrich Bornkamm: Thesen und Thesenanschlag Luthers: Geschehen und Bedeutung. Töpelmann, Berolini 1967. Erwin Iserloh: Luther zwischen Reform und Reformation: der Thesenanschlag fand nicht statt. Aschendorff, Monasterii 1968 (3. ed.). Joachim Ott, Martin Treu (ed. ): Faszination Thesenanschlag – Faktum oder Fiktion. Lipsiae 2008, ISBN 978-3-374-02656-2. Manfred Schulze: Thesenanschlag. In: Religion in Geschichte und Gegenwart 4, vol. 8. Mohr, Tubingae 2005, ISBN 3-16-146948-8, Col. 357 s.
Uwe Wolff: Iserloh. Der Thesenanschlag fand nicht statt. [= Studia Oecumenica Friburgensia 61] Institut für Ökumenische Studien der Universität Freiburg Schweiz, Friedrich Reinhardt Verlag, Basileae 2013, ISBN 978-3-7245-1956-0. ↑ in textu errore ducto poenitentia scripta est, quamquam coniunctio inter paenitentiam et poenam non est. ↑ sacerdos vicarius dei hic papae respondet. Vicimedia Communia plura habent quae ad 95 theses spectant. Vide Disputatio pro declaratione virtutis indulgentiarum apud Vicifontem. Novissima mutatio die 31 Octobris 2017 hora 13:44 facta.